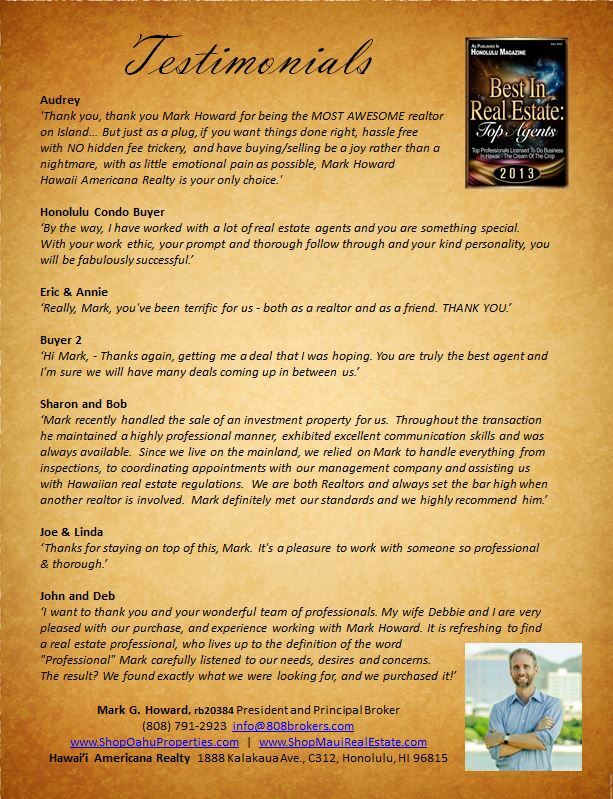 My name is Mark G. Howard and I am the Principal Broker and President of Hawaii Americana Realty, the friendliest and most customer-pleasing real estate company in all Hawaii ! Our congenial headquarters is located in beautiful Waikiki on the dynamic island of Oahu. And our specialty is serving clients and all their real estate needs, with a focus on the high-rise, single-family home, and luxury real estate market throughout the entire Hawaiian Islands. We’ve been serving with amazing success mainly the islands of Oahu & Maui. But recently we have extended our services to include the equally beautiful Kauai and the Big Island, thus incorporating the famous Kailua-Kona and Hilo areas. As a reminder, I am here almost around the clock to serve new and old clients alike and provide you the fast, efficient, and topnotch service you expect and of course, deserve. For the past 15 years, I have practiced my skills as a licensed Realtor in Santa Fe, New Mexico, Las Vegas, Nevada and now as Principal Broker & President of Hawaii Americana Realty, in Honolulu, Hawaii. I have gained a competitive edge in the real estate market by earning my status as an company broker and Accredited Buyer’s Representative (ABR). My professional doors are open 24/7 for you to contact me: online via my website or by email or by phone message at any time. The Hawaiian real estate market I excitingly remind you is now the place to sell, buy and invest. Be it a condo or small family home, a huge estate or upscale commercial property, you name it! No matter where you live in the world, you can contact Hawaii Americana Realty. We can find you the property of your dreams, or help you sell or invest in a prime piece of Island real estate that’ll make your mouth water!